I basically spent the last two years of my North Bergen High School education hanging out the English Department office or in a journalism office working on the school newspaper or yearbook. I am not quite sure how that happened. I know my senior year I did an independent study research and I used the English office as my office. I sort of took over seventh, eighth and ninth periods. Mr. Vecchione, Mrs. Whitehouse, Mr. Polente, and Mr. Boyle were my verbal sparring partners. When I was not actually working on my project, I was sort of, helping out in the office. Sometimes I was arguing with the teachers over some cause I believed in…mainly women’s rights. I think I was an English Department aide? Who knows? I cannot remember. But even before senior year, I had developed, what was for me, an important relationship with Mrs. Whitehouse and Mr. Vechionne. Celia Whitehouse’ impact on my life was the most visable. She provided the space for me to become involved in journalism and creative writing. Although I was never editor in chief of the yearbook or newspaper, I had editorial positions on the newspaper both junior and senior year, and on the yearbook in my senior year. Even when I was in college, I would come back to visit the English Department teachers and hang out in the office. I knew that they had to be missing me. And since my sister was in high school for three more years, I had an easy in. So conversations with Mr. Vecchione and Mrs. Whitehouse continued. It was Mrs. Whitehouse, who told me, when I was looking for graduate schools, that Columbia University was not the only place to apply. In fact, Missouri had a really good school of journalism. I applied…why not? When in high school I was in honors English and was a member of the Merit Society, which meant I could leave a class if there was no exam. I took that to mean I would be leaving class whenever there was a substitute, and hangout in the English office. Giving me even more time to be in my favorite place. Mr. Vecchione would just sigh when I showed up and invaded his space. I loved high school. 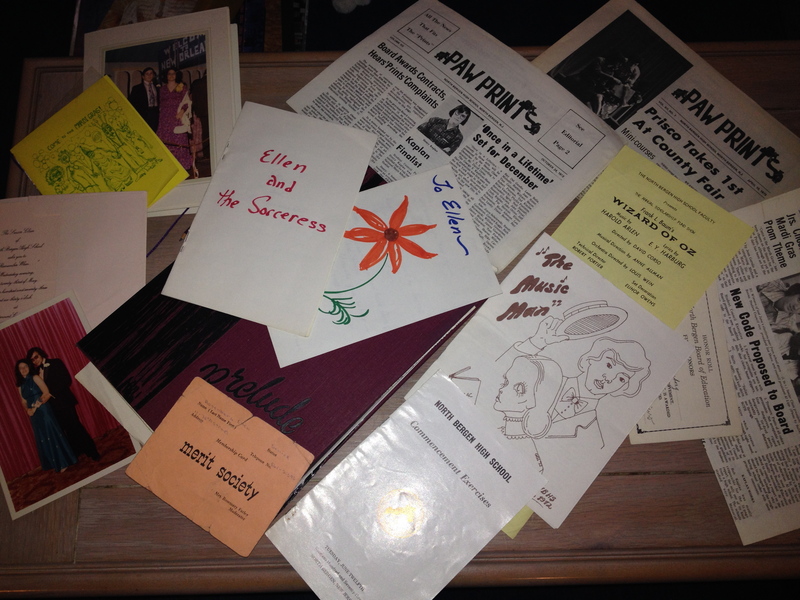 Junior prom, senior prom, yearbook, newspaper, literary supplement, independent study, school plays, all were fun times. Even my classes were fun for me. I loved school; I loved learning. We had a community of about 20 students who were in almost every class together. And the memories are still strong. During my junior year of high school, I became ill toward the end of the school year. I spent a week in the hospital, not fun at all. Mrs. Whitehouse not only came to visit me, she wrote me a book: Ellen and the Sorceress. Handwritten….no computers in those days. I still have the book! My honors English teacher, however, sent a take-home test to the hospital with my friend, Faye, who was afraid to give to me. I still remember her telling my mom about it, even though I was quite sick. My Mom was furious. She called Mr. Vecchione, asking, “Who sends a test to someone in the hospital?” Needless to say, I never took that test. But then they knew I was a good student. And I was not maligning. Believe me, a week in the hospital was not enjoyable. My days in the English department were not wasted. I received my undergraduate degree in English literature. I worked on the college newspaper and yearbook, continuing on the path I found in high school. Then on to graduate school, where I earned my master’s degree in journalism. 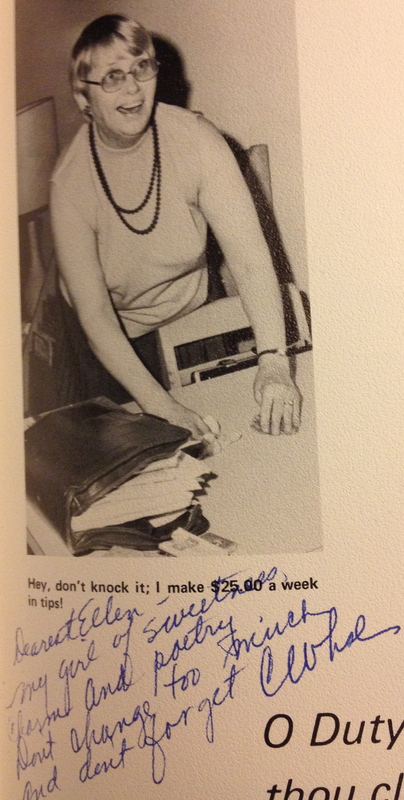 I even taught high school journalism for four years: in a way my homage to Celia Whitehouse, Anthony Vecchione and my many hours in the English Department office. Yes, of course I remember you! I also remember Donna Palazzo, but am not in touch with her. Smart of you to move to Paris. Much more accepting there, then New Jersey was in the early 1970s! I am glad that you have done so well and sound so happy now. It is not easy to be different and to live a different lifestyle. I always thought you were very brave. I was still in elementary school when you were in high school but all these years later, I still remember you. I think my brother was in your year and we were always going up to the high school for shows and other events. I thought you were the bravest person in the world to be yourself when people were so closed-minded. I was a very shy little girl and your refusal to back down really inspired me. How sweet a remembrance. Thank you for sharing and for including me in your kind thoughts. It meant a great deal. If you received an email address from Louis, I would be grateful if you would share it, so that I might share a kind and resonant word. I believe, for some reason,that he meant Donna Chiurazzi with whom I had a brief encounter when my daughter, now 24, wanted to visit the UN, because Palazzo, who was my neighbor down the street in NB, but whom I have not encountered, settled up here I. Plymouth, MA. My kid also graduated in English (and Psych, Communications and Film), and now works for Nightline (otherwise known in the industry as “Mouse-News” (Disney ownership). I am so glad to hear that you made all the right choices. There are some extraordinary people we had the privilege to know in our formative years, and I count you squarely among them! We had such a wonderful high school experience, for which I feel fortunate. You were an important part of the group of friends who we spent so much time with at school. My daughter spent a semester at the UN when she was in college at Drew University. SHe had a great time there. Thank you for the wonderful note! I have sent Louis with your email address. 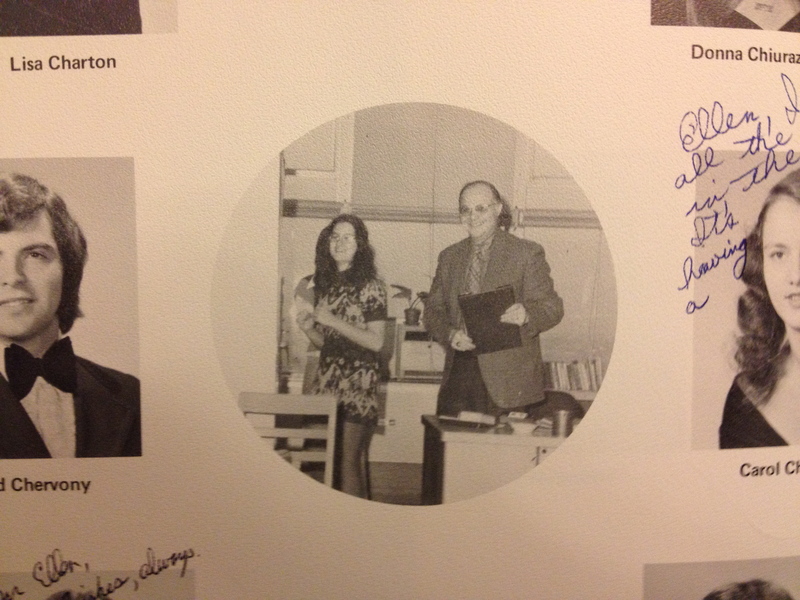 Ah, Mr. Steinberg was such a jewel…he and Herr Worobec were my least favorite teachers at NBHS. But somehow we managed to have fun in both their classes. Do you remember how upset my Mom was over that test? It is still so vibrant in my mind. Yes, those two were the most difficult. But you and I did have good times. 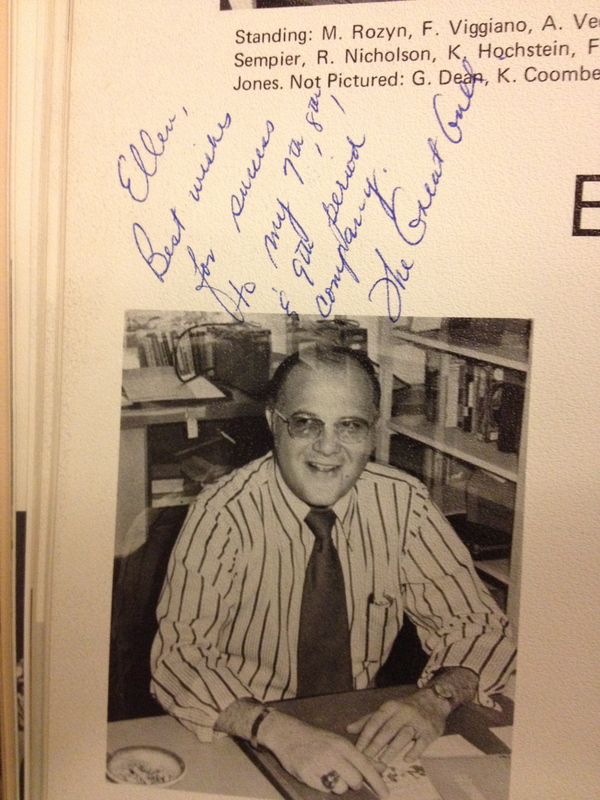 We don’t know each other but as a “71” graduate from NBHS I too had many of the teachers you mentioned. Funny, all the while I was in high school I thought we were getting a mediocre education. Not that I was in any way interested in academics at the time, lol, but once I reached college and then on to professional school I realized what a great education we received. Of course teachers like Roger Swett, Bob Rovere, Mr Sempierre, Bob Zink et al, were among those that made the experience tolerable and many times enjoyable. It always warms my heart when I hear success stories about former NBHS graduates. The concern and support of teachers at NBHS was wonderful. I agree.